High Efficiency Marine Solar Panels For Your Boat. Free help with your solar system sizing and design. Highest output panels for most power per square inch. We provide all sizes of rigid and flexible marine solar panels for your yacht, sailboat, houseboat, trawler or commercial boat. Our solar panels are built to our specifications especially for marine environments by highly acclaimed manufacturers. Our innovative marine solar panel mounting hardware is robust and made in the USA. The key to a quality and marine solar panel that will last is the quality of the solar cells used in the panel. We use only the highest efficiency grade A+ solar cells. Our panels are built with SunPower monocrystalline back contact solar cells, Bosch monocrystalline cells or Qcell polycrystalline high efficiency solar cells. Our solar panels have essential blocking diodes built in and potted (filled with silicone) junction boxes. 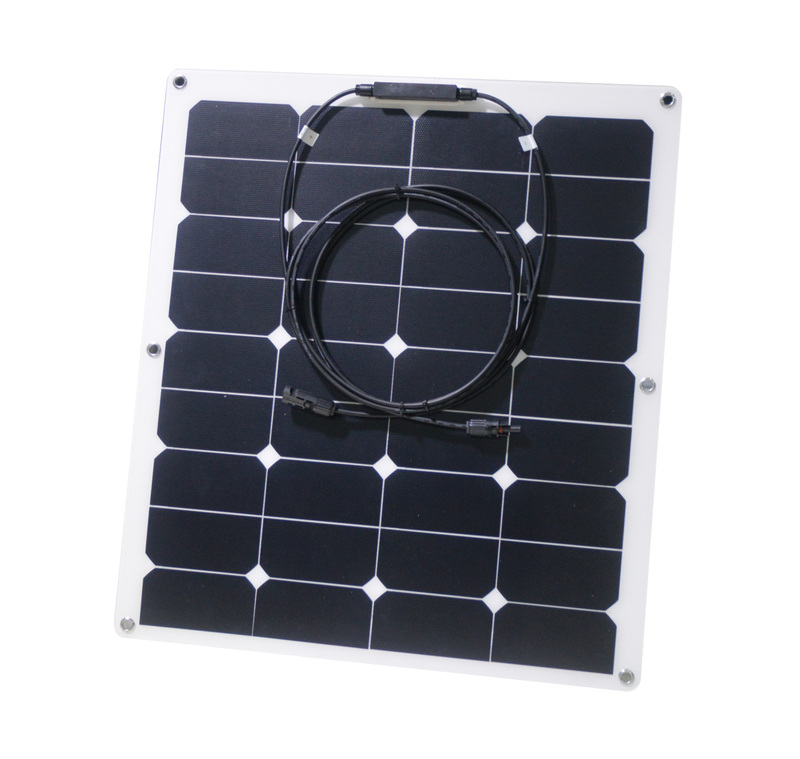 Our rigid solar panels have strong anodized aluminum frames and marine grade sealants. Our flexible solar panels average the same output per area as our rigid panels and are constructed with high quality ETFE laminates that won't deteriorate (go milky) or delaminate from intense UV exposure. That is why we are comfortable offering a 1 year warranty on all of our semi-flexible panels and a 5 year warranty on our rigid panels. 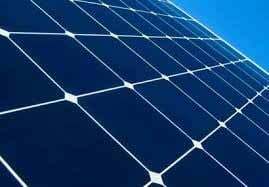 ​Panel Type - There are many articles written on the two types of solar panels also referred to as photovoltaic panels (PV) ; monocrystalline and polycrystalline. Monocrystalline panels are made up of single crystal silicon wafers. Polycrystalline panels are made using silicon wafers that have a multiple crystalline structure. There are pros and cons to each type of panel. Monocrystalline panels have a higher output per square inch in direct sun. They can be sensitive to shading and output will degrade faster on cloudy days. Polycrystalline panels tend to have a slightly lower output per square inch in direct sun but are not as sensitive to being shaded and output will not degrade as much on cloudy days. We recommend polycrystalline panels in northern areas where cloud cover is common and monocrystalline panels in areas of consistent sun. It is important to note that today's newer high quality polycrystalline panels perform within 5% of monocrystalline panels in full sun. Panel Solar Cell Quality - Because boats have a relatively confined space, maximum power output per surface area is very important. The quality of the solar cells used in solar panels is a key factor in determining the panel output. Solar cells are passed under a standard light source and graded as to their output (1-10). Grades are grouped into classes. Class A solar cells are grades 8-10, Class B solar cells are grades 4-7 and so on. Solar cell quality follows a bell curve; there are many more Class B solar cells than Class A. We at CMP specify only the best Class A-9 solar cells for use in our panels which results in a panel efficiency of 16-24%. 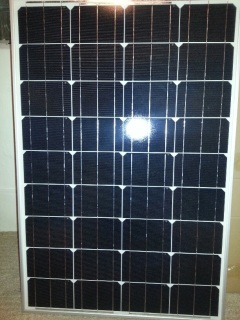 Less expensive Class B and C panels are often used on land based solar farms where space is not an issue. Though a bit more expensive, our customers have reported that our solar panels often outperform the performance rating on the panel label. ​High quality high performance solar cells will produce more power at various sun angles than lower quality solar cells; up to 30% more power. An important consideration in determining how much solar power you need is how many watt hours or amp hours of power you can expect to generate in a 24 hour period. Let's say you cruise in an area that receives an average of 5 hours of full sun a day. The average is computed based on the seasonal sun angle and the sun angle from morning through evening. A 100 watt solar panel with average efficiency solar cells may produce 100 watts x 5 hours or 500 watt hours of power in a day. At 13 volts that's about 38 amp hours in a day. A 100 watt panel with high efficiency solar cells will produce up to 30% more power in a 24 hour period or 100 watts x 6.5 effective hours or 650 watt hours of power in a day. At 13 volts, that's about 50 amp hours in a day. 38 amp hours vs. 50 amp hours in a day is significant on a boat. Add more panels in the mix, say 400 watts and we see 152 amp hours vs.200 amp hours, a difference of 48 amp hours. This simple analysis does not take into consideration the impact of clouds or shading both of which will make the disparity even greater. Clearly, the higher the quality of the solar cells the more power produced over time. Panel Shape - The largest market for solar panels is commercial applications where many many panels are mounted on a roof or in a field. These panels are usually rectangular in shape often twice as long as wide. This shape is often not ideal for marine application. Often a more square shape is preferable, especially for pole mounting. Marine Grade - It's no secret that the marine environment, especially salt water, can be tough on equipment. To withstand the rigors of the marine environment, solar panels should have strong stout anodized aluminum framing, should be well sealed and waterproof, and have the electrical box on the back of the panel encased in an inert non-corrosive waterproof material (like silicone) to protect the electronic components. Quality marine grade solar panels are designed with bypass diodes to significantly reduce the impact of shading that so often occurs on a boat. Choosing the right panel for your needs will require study and/or discussion with PV panel experts. Our staff at Custom Marine Products are ready to help you design the best solar system for your marine needs. Contact us via email or phone for a free consultation. ​How much solar power do you need on your boat? ​The amount of power needed while cruising depends on many factors including the energy used by appliances and lighting, the output of the engine alternator, the climate and the length of time away from shore power. These and other factors will determine the amount of solar power and thus size of the solar panel(s) you may need for your boat. Check out our seminar slides titled Selecting the Proper Solar System and our tutorial titled A Cruiser's Guide to Selecting and Sizing a Solar Charging System under our SUPPORT section. Working with Ed Foster our PV engineer, we have developed several worksheets to assist you in analyzing your on board power generation and consumption and estimating your solar power requirement. Print out our Solar Power Calculation Worksheet and use it as a guide to calculate your power generation requirement. Several other worksheets can be downloaded in our Manuals and Info section. We have developed easy to assemble kits for rigid panel top-of-pole mounting and for semi-flexible panel bimini and hard surface mounting. 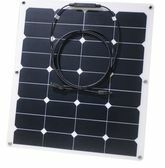 Each kit contains everything you need to install a solar system on your boat or RV. Properly matching solar panels to charge controllers can greatly increase the system charging efficiency, reducing battery charge time and increasing battery life. 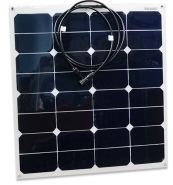 Our complete solar panel kits provide everything you need to install and operate a marine solar system; solar panel, hardware, charge controller Solar Controllers, solar wire, MC4 connectors and instruction manual. Contact us for help in designing a custom kit specific to your needs. Our SunPower monocrystalline cell flexible 55 - 150 watt high efficiency solar panels are manufactured to our specifications by highly acclaimed solar panel manufacturers. Quality materials - We use impermeable ETFE laminates that will not cloud of degrade with exposure to intense UV light. Grade A+ SunPower solar cells - The panels are comparable in performance to our rigid panels. Mounting flexibility - Flexible panels will contour and flex against curved surfaces with a maximum bending radius of 30 degrees, ideal for mounting on a bimini top or a curved deck surface. Mounting options - Each panel can be affixed by high bond tape, snap, magnetic or screw mounting. Our screw mounting system has become the most popular method of attaching solar panels to canvas biminis and dodgers. Grommets are an added bonus for ease-of-installation. Plug and play - All panels come with industry standard waterproof MC4 connectors on 3 foot (1 meter) long pigtails. Maximum output with shading - The panels are equipped with blocking and by-pass diodes so a shaded panel has minimal effect on the solar array performance. Purchase options - These panels can be purchased individually or as a complete easy to install kit. Durable - Although not recommended, the panels can be lightly stepped on. SOLAR TAX INCENTIVE: As long as there is a head, galley, and at least a bunk onboard and your boat is docked in the United States, your vessel qualifies. This Federal tax credit is a 30% credit on all qualified expenses to purchase and install solar panels and a solar system (including any installation charges), with no maximum limit for equipment placed in service after 2008. Plus you may have tax credits in your state. These panels are ideal for mounting on a canvas top or a curved deck surface. Mounting grommets, MC4 connectors and blocking diodes are included. These panels are ideal for mounting on a bimini top or a curved deck surface. Mounting grommets, MC4 connectors and blocking diodes are included. These panels use 23.7% efficient SUnPower solar cells. They are ideal for mounting on a bimini top or a curved deck surface. Mounting grommets, MC4 connectors and blocking diodes are included. The ideal marine solar panel must be highly efficient (maximum output per surface area) and robust enough to withstand the harsh marine environment. We offer various sizes and types of solar panels to meet the unique needs of our customers. For the cruising boat with modest power requirements, we recommend our 100 - 140 watt panels and for the cruising boat with greater power requirements we recommend our 140 - 175 watt panels. 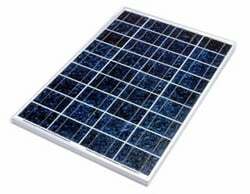 We offer both monocrystalline and polycrystalline panels. These panels are excellent for mounting on a pole, a rigid deck top or a bimini frame. Our new 150 watt rectangular panel (57 x 21 inches) is ideal for mounting on dinghy davits or stanchions along the side of the boat. All CMP (Custom Marine Products) solar panels are high quality, high output Class A+ marine grade and backed with a 5 year manufacturers and CMP warranty. 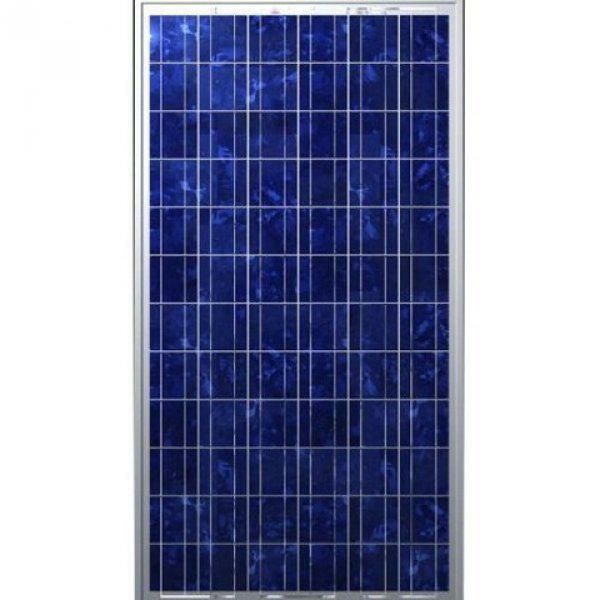 This Monocrystalline solar panel with premium SunPower solar cells and is one of the most efficient panels available at over 22% efficiency. 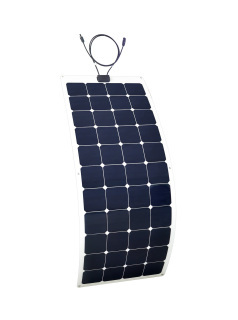 This marine grade solar panel will perform extremely well in both full and partial sun. It is built to withstand the harsh marine environment and is ideal for top-of-pole mounting in a 12 volt system. Our 140 watt monocrystalline solar panel uses premium SunPower solar cells and is one of the most efficient panels available at over 22% efficiency. This marine grade solar panel will perform extremely well in both full and partial sun. It is built to withstand the harsh marine environment and is ideal for top-of-pole mounting in a 12 volt system. When integrated with our Tracer BN MPPT controller, this combination provides the highest output per sq. inch of any most system available. You can expect at least 55 amp hours on a sunny day although some customers have reported as high as 60 amp hours a day. Our 150 watt monocrystalline solar panel is powered by premium SunPower solar cells and is one of the most efficient panels available at over 22% efficiency. This marine grade solar panel will perform extremely well in both full and partial sun. It is built to withstand the harsh marine environment and is ideal for dinghy davit mounting in a 12 volt system. When integrated with our Tracer BN MPPT controller, this combination will provide the highest output per square inch of any system available. You can expect at least 64 amp hours on a sunny day. This panel is ideal for mounting on dinghy davits or stanchions along the side of the boat. Our 175 watt monocrystalline solar panel is powered by premium SunPower solar cells and is one of the most efficient panels available at over 22% efficiency. 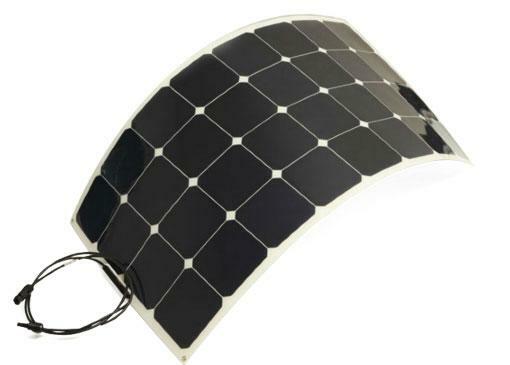 This marine grade solar panel will perform extremely well in both full and partial sun. It is built to withstand the harsh marine environment and is ideal for top-of-pole mounting in a 12 volt system. When integrated with our Tracer BN MPPT controller, this combination will provide the highest output per square inch of any system available. You can expect at least 72 amp hours on a sunny day. 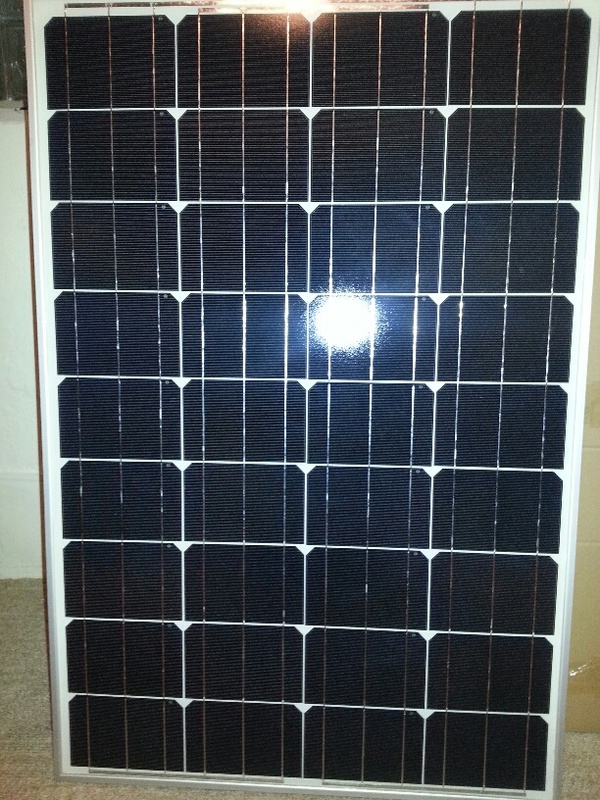 105 Watt Monocrystalline marine solar panel with blocking diodes and MC4 connectors. 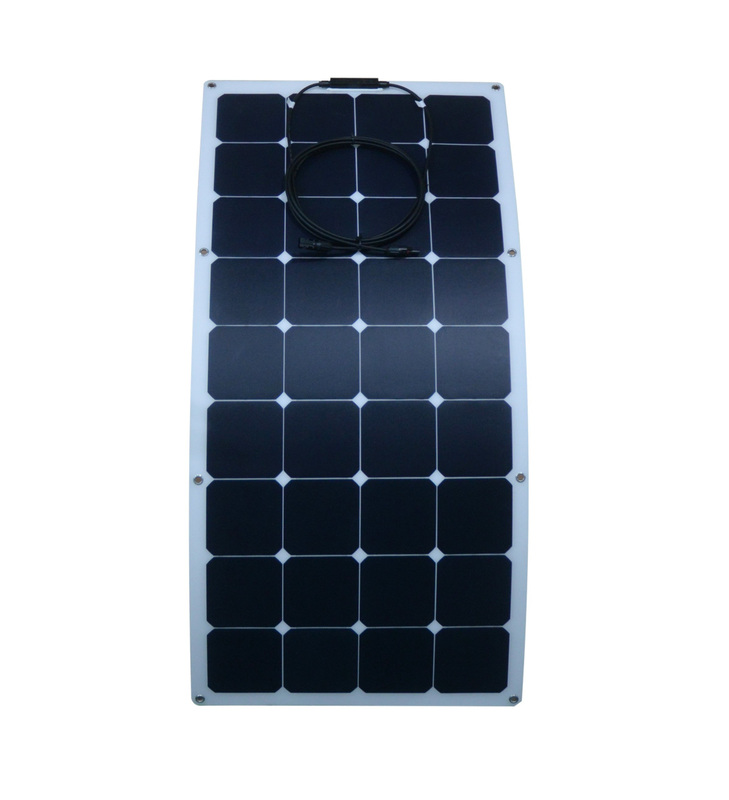 Our 105 watt monocrystalline solar panel uses Class A+ Bosch solar cells and performs at 17.9% efficiency. 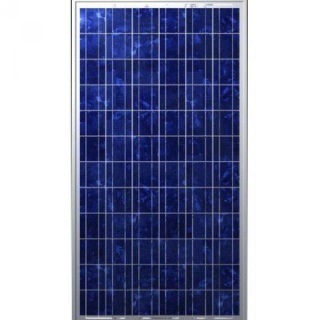 This marine grade solar panel will perform extremely well in both full and partial sun. It is built to withstand the harsh marine environment and is ideal for top-of-pole mounting in a 12 volt system. You can expect at least 34 amp hours on a sunny day. 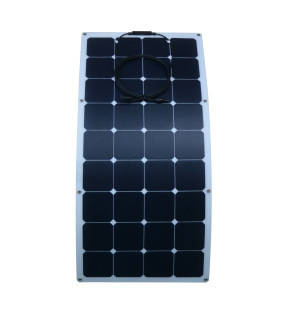 Our 100 watt polycrystalline solar panel is an excellent overall performer in sun and cloud due to the use of very high quality Class A solar cells. It is tolerant of some shading from rigging. As with all of our rigid solar panels, the electrical box is sealed (potted) with inert silicone to eliminate any possibility of corrosion. Our 150 watt polycrystalline solar panel uses the same technology as our popular 100 watt panel, is 16+% efficient and will perform well in both full and partial sun. This panel is tolerant of partial shading from sails and rigging. It is ideal for top-of-pole mounting. This polycrystalline solar panel is rectangular in shape. At 16+% efficiency it will perform well in both full and partial sun. This panel is tolerant of partial shading from sails and rigging.